After years of falls, road deaths have stopped falling. In fact, in previous years they’ve rising fast enough for the Department for Transport to pre-releasing figures and ministers to start getting their defence in early. UK transport minister Robert Goodwill warned a parliamentary road safety conference last week to prepare for “bad news” ahead of Thursday’s announcement, telling attendees to expect a “rise” in road fatalities. …concerned that progress increasing levels of road safety has levelled off and is launching an inquiry to scrutinise the Government’s approach to road safety, last set out in its 2015 road safety statement. The inquiry will investigate which changes would be most effective at reducing the number and severity of road traffic accidents. And the EU are talking about the compulsory fitting of satellite-controlled speed limiters (Intelligent Speed Adaptation – ISA – even though it’s anything but intelligent) to cars from 2020. The UK says it will comply and do likewise. H.L. Mencken said: “For every complex problem, there is a solution that is simple, neat, and wrong.” He could have been describing the UK’s road safety policy. This isn’t about a fall in the numbers of traffic police, this is about a road safety policy that has focused on what’s measurable rather than what’s important. And, worse, it has simplified the complexity of safe driving to slogans like ‘twenty’s plenty’ and ‘speed kills so kills your speed’. What’s happened? We have cars and motorcycles with the most advanced passive safety ever. We’ve seen those passive safety features, like ABS and traction control, give us safer and safer roads. We’ve got cars designed to reduce the harm they do to pedestrians when they crash. When drivers do get it wrong, we’ve got active safety that deploys airbags, pre-tensions seatbelts and stops cars being death traps. Yet now we’re seeing fatalities and serious injuries rising. The honest truth is that no-one really knows. And that’s because road safety has become a single issue game and the politicians and road safety groups are sat around with their fingers in their ears singing “la la la can’t hear you”. Driving a car or riding a motorcycle is the most complex thing you’ll do today. Your level of observation, anticipation, evaluation of environmental and vehicle feedback and psychomotor skills would still blindside any computer yet built. And that’s before you factor in your constant interactions with other drivers, evaluating their actions and planning for what they’ll do next. Get on a motorcycle and it gets even more complex. Keep a machine upright through corners when it’s naturally unstable, plus all the other stuff. Yet, according to current road safety policy, all we have to do to be safe is match a number on a dial to a number on a stick. And if we don’t, there are cameras of many different varieties to make sure we get a fine and some points a few days later. We’ve delegated the complexity of solving the road safety problem to a combination of yellow boxes on poles enforcing frequently changing, arbitrary speed limits on sticks. It’s drive-by-numbers. And, like paint by numbers, it’s a dreadful, lumpy facsimile of the real thing. Given the importance of speed limits, you would think, wouldn’t you, that the numbers on those sticks would be scientifically robust, backed up by hard evidence and – ideally – as close to physical absolutes as possible. It would be tragic to think that they’re simply set by your local councillor, terrified of losing votes, against the advice of the local police force. Why, despite millions spent on lower limits, cameras, bumps, humps and hardline speed-enforcement, are deaths not falling? Because we’ve decided that the complexity of real road safety is politically unacceptable. And we’ve replaced it with a sort of no-carrot-and-lots-of-stick donkey policy. Speed cameras are binary. You’re either legal or not. Safety doesn’t come into it. And if you’re illegal, you get a slap. We’ve traded safety for compliance. Binary solutions don’t – and can’t – work with complex problems. And you can’t get the sort of concentration and behaviour we need from drivers if they’re constantly expecting a slap. Speed is certainly a simple enough issue to address superficially. Put up cameras, paint them whatever colour you like, raise fines, put in new, ultra-low blanket speed limits, change them every half mile and propose stiff new penalties for exceeding them, then watch the accident figures tumble. Sadly, as we have seen today, they are not tumbling. Speed cameras, traffic calming and lowered speed limits encourage the majority of drivers to think that it’s easy – by sticking to a limit they are safe – when nothing could be further from the truth. Poor drivers driving slowly crash at lower speeds – but they still crash and they still kill people. Do we believe this is acceptable? We need to refocus the road safety debate away from speed limits and on to the much more complex and politically unpalatable subject of driver standards, education and training. So why don’t we re-train drivers? The argument is usually around cost. But the cost of a fatal road crash is usually put around £2m and we killed 1,710 people in 2017 on the UK’s roads and injured thousands more. The cost argument just doesn’t stack up. Then there’s political acceptability. Think about the political implications of advocating compulsory driver and rider retraining on your local MP’s re-election chances for a second. So how about this as an alternative? We know that trained drivers crash less (ask IAM Roadsmart). If they crash less, they cost insurance companies less too in personal injury claims and claims for repairs. If we could quantify that, why not use reductions in insurance premiums to incentivise regular, post-test driver training? Nip along every 5 years or so and get some proper post-test training in observation, planning, anticipation and hazard management and your premium goes down accordingly. And so would the death and injury rate – because it’s training like that that gets people going slowly where they need to, rather than just mechanically matching that number on their dial to the one on the stick. It’s only when we recognise how complex the driving process is and educate all road users accordingly that we’ll stop killing people. ← Let the passengers take the strain. I stops ’em and tries to educate ’em but they still think I’m only doing to make my bosses happy. Not so, I dislike shovelling the dull buggers off the road and telling people who’re related to them. Yes, observation is the thing. And that’s the bugger. For some people, their appropriate speed will be much lower or much higher than the posted limit. And as well as that it’ll vary dependant upon the extant conditions. I think you have it right when you mention numbers on a stick but then it’s a matter of catering for the lowest common denominator. Insensitive? Perhaps but at a cost of around half a million for each fatal red mess on the road surface to condolences from the Coroner, there has to be some way of lessening the pressure on the public purse. I don’t know what the answer is because each time I think I”m coming closer to it, the question runs away again. That’s because we are into the law of diminishing returns. If we keep on lowering speed in the hope of making roads safer, we logically proceed to the point where nobody gets hurt because nobody moves. We have seen substantial improvements in the past (not least in the 1930s when speed limits out of town were scrapped) but now the control and punishment has to be ever more draconian to achieve smaller and smaller improvements. Tommy, my point was that what some people regard as an appropriate speed for the extant conditions isn’t. Usually due to an insufficiently accurate reading of the conditions. I know that when I’ve found myself feeling a little dazed and confused following an occurrence on the road, honest reflection will usually point towards a deficiency in my own judgement about my environment at that critical point. Yes, a driver might sometimes make an insufficiently accurate reading of the conditions. Those conditions change and depend on the vehicle and the driver as well as traffic, weather and so on. However, the fixed blanket figure that the guy at the council decided on regardless of all those possible variables cannot be any more accurate, can it? Appropriate speed is always going to be a variable. I don’t personally believe in a fixed limit but some of my valued clients aren’t to be trusted at any speed lol! Now that’s a feeling I’m familiar with. I wonder if the numbers on sticks affect the wrong sort of driver, though. Skill levels are relatively low for people who’ve just passed an L test. They tend to drive to the road alignment (I think) rather than the limits, so they’ll be running at around the 85th percentile. If they stick to the limit, it diverts concentration from observation, anticipation and hazard management simply because the road alignment is suggesting they go faster. I’m far from a speed-freak (seen my Ural combo? 55mph tops on a good day), but the conflation between a speed limit decided by a local councillor scared of losing votes and the safe speed for the conditions worries me. Road safety in essence is an attitude of mind. I gained a Cycling Proficiency certificate whilst at school aged 7, and passed my test when 16yrs of age on a motorcycle. I had no formal training, just purchased a bike (150cc Villiers powered Francis Barnett) slapped some ‘L’ plates on and relied on my previous experience as a cyclist and knowledge of the Highway Code to keep me out of trouble. My attitude of mind was confined to getting to my destination without falling off, bumping into anyone or breaking down. I passed my car driving test a few years later after a couple of half hour familiarisation lessons, but bikes were my main personal transport. At 23yrs of age having been a delivery van driver for a year or so, I applied for a bus drivers job following a move to rural location. Here I was faced with a full time training program lasting two weeks driving both double deck and single deck buses under the very critical eye of a London Transport instructor. The key factors were on observation, reading the road ahead, recognising potential hazards, road positioning and the primary consideration of passengers and other road users to ensure safe progress for all. Summed up; observation, anticipation, consideration. Those two weeks and the following years of driving in service taught me enough to have since safely navigated several million miles on four wheels and two. Accident free on four wheels, and mostly on two with a few exceptions where I had been knocked off the bike through carelessness of third parties during a period of over 20 years despatch riding which followed my public service driving (slow speed accidents at less than 20mph). Since the flood of segregated lanes, pavement build-outs, speed humps, speed cameras, chicanes and a plethora of road junction layout changes, we have seen more hazards and obstacles placed in the path of vehicles in the name of road safety than ever before. The image depicted in Mark’s article of a carriageway obstruction is just one classic example of how some minds view road safety – ‘stop them’ at any cost. In a small town near me just such a carriageway obstruction was built with accompanying sets of hard rubberised speed pads along a quarter mile of 30mph limit road. 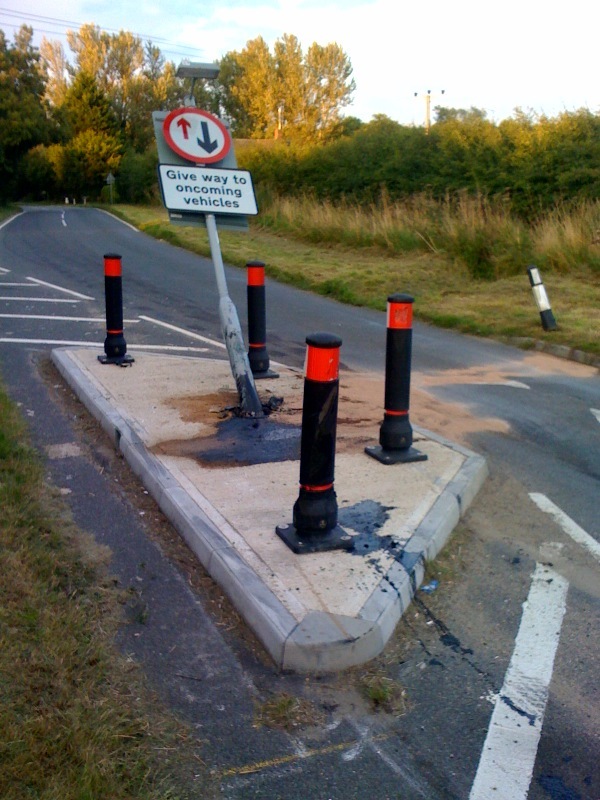 The speed pads were so placed to encourage drivers to take a centre of the road line in an attempt to avoid the greatest discomfort, creating a further hazard of confronting an oncoming vehicle – just as the built obstruction does. Thankfully, the local Council have seen some light, and removed the speed humps completely, though the build out remains. And why were these hazards erected? As prior to, there had been no history of collisions, injuries or deaths along said section of road – save one pedestrian injured over a five year period at the light controlled crossing. Hazards, created and erected in the name of political correctness by a committee pressed into advancing road safety by organisations seemingly bereft of commonsense, but loaded with do-good mentality. These are not the correct attitudes of mind to enhance road safety. The video shows how the driver is assaulted by a ringing bell, or vibrating door handles when about to make a manoeuvre that might lead to a collision. The video is of course carefully staged to emphasise the effectiveness of such devices, but observe the actions as they unfold: The car is stationary in a left turn lane only preceding a roundabout. It has its left hand indicator on. The cyclist approaches from behind and on the vehicles left, ignoring the cars indicator, and proceeds straight on at the roundabout. Fail! Second sequence: Driver parks and is about to open his door without checking behind. Fail! In addition to which, after he gets out of the car, steps across the road without looking for further traffic. Fail! A staged scenario but how much are we taken for fools when technology such as this is foisted upon the gullible public and road safety ‘experts’? Correct education for cyclist and driver would eliminate the need for said gadgets, and the “need” for such gadgets are manna from heaven for the various departments dealing with road engineering and safety, as the cost of training – education – is passed on to the consumer/road user, and the need for a new compliance steps foot into the lives of all and seldom benefits any, save manufacturers and the do-gooder element. Educating road users is the most costly avenue to road safety. But the road safety attitude of mind amongst authoritative bodies has become an accounting exercise. Do whatever is cheapest – but do something. Anything. I emigrated to Canada in 1992. I recently came back to the UK for a holiday for the first time in over 20 years. Having passed my test in the UK I thought driving would be easy. However, I spent most of my driving time distracted by matching my speed to the speed cameras. I paid little attention to anything else. it’s a wonder I didn’t rear end anyone. In Ontario shortly after I arrived in 92 there was a provincial election. The incumbent government was in the process of introducing speed cameras. They lost the election because the opposition promised to abandon the idea. As a consequence we have none today. However, we do have speed limits 100kph on main highways (motorways) and 80kph on major roads. It is enforced, by police speed traps. And they do work, I got nailed about three times for driving at UK speeds when I first came over here. it cost me money in fines and increased insurance premiums. I don’t do it anymore and haven’t had a fine for over ten years. Drivers driving slowly do still crash, but they crash much less frequently. As a result, and because impact speed affects the level of injury sustained, they also kill less frequently. Poor drivers make more mistakes than good drivers. But all drivers make mistakes. If you make a mistake at 20 you can bring your vehicle to a complete halt in the space that’ll leave the 30 driver still doing 24mph. By all means suggest we take the poor drivers off the roads and retrain them before letting them loose again. But suggesting there’s a binary decision to be taken between speed control or driver education is simple, neat – and wrong. So take it to its logical conclusion. Speed limit zero: nobody moves so nobody gets hurt. Of course that’s ridiculous, but where do you draw the line? 20mph? 5mph? Man with a red flag? You just took it to its illogical conclusion. Taking the counter-argument to its illogical conclusion would mean advocating no speed limits whatever. Unless that’s being seriously proposed then we all agree that a line does have to be drawn – we’re just nitpicking over the detail. In the 1930s, the national 20mph speed limit was scrapped and there was no limit at all outside built up areas. Road casualties fell dramatically. When the blanket 70mph limit was introduced there was no sudden fall in the accident rate. In the absence of a speed limit, people tend to select an appropriate speed all by themselves. Obviously some get it wrong occasionally – with or without speed limits – but most get it right. I doubt very much that we do need speed limits (as opposed to laws requiring drivers to pay due care and attention) but if you don’t feel you can be trusted to select a safe speed without a number on a stick, then lets set the limits at a level suitable for good, experienced, sensible drivers rather than dumbing down to the level of the least competent. As I’m sure we’re both good drivers(! ), we’re both fine with selecting appropriate speeds without those pesky numbers on sticks. But we’re also both surrounded by the less competent . If everyone was as stellar behind the wheel as we are (tongue firmly in cheek again), the numbers on sticks wouldn’t be needed. But because the bar for getting and retaining a driving licence is set low enough for most people to drive, then we really do need to organise our roads with the dumber drivers in mind, to stop them wiping us out in even greater numbers than they already do. The alternative is to set the standard of what we consider competent driving much, much higher than it currently is. It would allow us to dispense with all speed limits, but also result in a massive chunk of the population having their licences permanently removed. It might be theoretically do-able, but in practice? No, I don’t think so. I am saddened by your misanthropic view of your fellow men and women. I have faith in them. Like I said, only a minority is at fault. And we have laws about driving safely. Fair enough, I can’t really argue with someone who genuinely advocates repealing all speed limits. Absolutely 100% agree with all your points. Well written and so so true. I have driven well over a million miles on many roads throughout the world. I am lucky as I have driven most of these miles in high performance cars. Yes, the laws of average have found me speeding on occasion! I have attended two speed awareness “courses” in the past 15 years. After both of these I have written to the police to suggest everyone would benefit 100% if everyone had to do a compulsory “refresher” driving test every 5 years. Not the test we all do to be allowed on the roads. A proper test including all the points you make. When we all first drive it is impossible, too many things to do in the car, cars everywhere on the roads, lights, people. So the test now can only get you to a point to pass the test. It is hard but most get there and pass. After a year or so we operate the car without thinking and so have far more ability to look at the road and outside the car. At this point to do a refresher test it would be possible to absorb many many details that you just can’t when you initially learn to drive and pass your test. Most people then after a few years consider they are good at driving (me too!) and like driving (and me!). But there is no compulsory way to know this! I don’t believe we would object to more “compulsory” training at a cost to ourselves if it improved road safety, lower insurance premiums and overall better driving standards. There are people who say, “I’m not really a good driver” Perhaps they shouldn’t be allowed to drive until they are good, competent and say they are and accept the responsibility of driving. Obviously this won’t happen, self senorship doesn’t work. But compulsory 5 yearly refresher driving tests by default achieves this. If you don’t pass you can’t drive. Harsh perhaps but. If a pilot said he wasnt good at flying but likes flying…! It’s a win win win veryone benefits. Finally, I have never received a reply from the police to either of my letters! Thanks Peter – really appreciate that.